These were even better than I expected (and I had high expectations), and go along with his book about his father. Second, John Piper's biographical message on the life, ministry, and martyrdom of William Tyndale: Always Singing One Note--A Vernacular Bible (MP3). I was particularly struck by the historical inaccuracy of a terrific movie we had recently watched--A Man for All Seasons. Piper says to not get our history from movies. After listening to Piper I begin to think that Thomas More didn't love Jesus at all. He burned people who translated the Bible into English--and who even read the Bible in English--and he did it with jocularity. I doubt he was anything like the great man the movie portrayed. And third, I got to listen to a great series of messages on a theology of marriage, derived from 1 Corinthians 7. These were from Pastor Mike Bullmore (of whom I hope to write a Whence Matt post sometime soon). In December of 2006, I attempted to make sense of this passage of Scripture and studied for 2 weeks before delivering this message. These messages from Dr. Bullmore are exactly what I wish I had said then. They are a model of clarity, lucidity, carefulness, and power. Dan Ledford on God's holiness. May you take time to be holy by taking time to be with the Lord. The wise folks at CCEF have been publishing helpful booklets for a number years. Our church has kept a stock of them in the foyer for last 5 years. The booklets are designed for use in a variety of settings. Pastors and counselors are encouraged to utilize them in conjunction with regular counseling sessions. The concise format, affordable price, and contemporary, compelling cover art make these materials ideally suited for the check-out area or gospel tract section of a bookstore or a free display in a church lobby. "So many of the issues addressed in this series are associated with deep shame, and many people haven't yet summoned the courage to talk to someone about their problems," Teears reflects. "The simple act of reading a booklet can be the first step toward confronting and dealing with their sin." Though each of the 21 topics included in the scope of this series was chosen to speak directly to known issues within the body of Christ, several are of particular need in churches today. In an era in which divorce has become as common within the body of Christ as in the secular world, the release of Divorce Recovery by Winston T. Smith could not be better timed. Smith offers biblical advice on how to forgive an ex-spouse, help children cope with divorce, and begin the process of starting over again. He also explores the biblical issues surrounding remarriage. Single Parents by Robert T. Jones speaks directly to the needs of a growing segment within the church population who often feel out of place and marginalized by the rest of the congregation. Jones instructs single parents to embrace their identity as Christians rather than attempt to fit in either the "singles" or "parents" categories. Regardless of the circumstances surrounding their single parent status-whether they are divorced, widowed, or have never been married-readers will be encouraged to discover that God's heart breaks for the widow and the fatherless, and he has extended some special promises just for them. Every parent-whether they are single or married-will experience moments when their children push them to the limit. How Do I Stop Losing It with My Kids? by William P. Smith offers readers a new perspective on effective discipline. The booklet examines the real reasons parents often lose control of their own emotions when dealing with misbehavior and reveals the most effective methods of winning a child's heart. This ultra-compact guidebook delivers specific, workable suggestions for frazzled parents. Unfortunately, when adults lose control, children are often the ones who pay the price. For anyone who has ever suffered from verbal, physical, or sexual abuse, David Powlison's Recovering from Child Abuse presents an encouraging message: Abuse is not the last word of your life story. God is at work in you, and he can redeem even the most painful and unfair moments of your life to accomplish his purpose for you. Because the formative nature of child abuse causes deep wounds that often carry over into adulthood, the booklet includes practical strategies that will help abuse victims learn to trust others again, release bitterness, build healthy sexual relationships with their spouses, discipline their own children in appropriate, loving ways, and learn to deal with conflict. This one: Jones, Single Parents: Daily Grace for the Hardest Job is written by my friend and former EFCA Allegheny District pastor, Robert Jones (author of Uprooting Anger). I can't wait to get my hands on these and put them in others' hands! And Why Marriages Become Distant and How to Reconnect. On the first day of this month, I wrote about my indebtedness to Raymond C. Ortlund, Jr. I see now that RCO has written the study-notes on Isaiah for the upcoming ESV Study Bible [see a .pdf of the intro to the book and the first 2 pages of notes]and has given an interview on this over at Unashamed Workman. Worthy of reading. RCO has also recently been featured on Joshua Harris' blog with a copy of his preaching notes as he takes them into the pulpit with him. George Cannon has a new blogger's version (NBV) of James chapter 3. Perhaps our prayer before meals should be more than simply "Saying grace." The glutton should spend time in prayer drawing near the throne of grace, asking the Holy Spirit first to mortify any gluttonous temptation. Then we are in a position to "give thanks" for the food God has set before us - and, with the Spirit ruling our hearts, eat an appropriate portion. I am going to attempt to pray before I even come to the table - praying for the Spirit to mortify - and then pray again at the table - giving thanks. Dan Ledford on God's Power in Revelation 4. Byron Harvey has a list of Unfortunate Metaphors supposedly used in High School essays. Tomorrow I get to preach on Proverbs 15:3. My official report on the 2008 EFCA National Leadership Conference is now posted on the new EFCA Today website. The EFCA's website, efca.org, just got a total makeover, including a dedicated URL for our magazine: efcatoday.org. It sure feels good to be home. The Country Bumpkin returns and thinks he's a big city sophisticate! Milk Reviews on Amazon? [HT: Bob Blog] Our family is milk snobs, only like real milk from the Meyer Dairy, but this goes further than we do! Grange Fair! Our family is going this year for the first time. I am not a Sabbatarian, but I resonate with RCO's point here. Of course, practicing it well is another thing entirely. Byron Harvey on God's grace to and through Paul in a Mediterranean storm. And you've gotta love the 60's pop culture references! David Powlison is one my professors for my CCEF classes last week and this. Today, he is going to lead us through a case-study of "Anne" a person who is suffering from major panic attacks and is wondering if she is going crazy. Does the Bible speak to her? You bet it does! Dr. P is showing up and more in the blog-world. A few weeks ago, he co-wrote a great article on passing on bad reports about people. This morning there is a new interview with him on Bible application, including a .pdf of a superb article he has written for the soon to come out ESV Study Bible. This is the kind of sweet thing that I'm getting all day, every day for 2 weeks. I am blessed. I'm back in Philly for Round #2 of my doctoral classes. The Country Bumpkin made it in this time with no problems, but, boy, was it hard to leave my family! This week: Counseling Problems and Procedures & Counseling and Physiology. Dan Ledford on God's wisdom. Traveling out to Philadelphia on Sunday and navigating the metropolis has convinced me that I've become something of a country bumpkin. This city's roads don't make any sense. The names of the streets don't stay the same from section to section. Some streets cross others, some don't. Sometimes a street name will disappear and then reappear again miles from where I thought it would. Of course, silly me, I didn't bring a map (just some Google directions) and my dome light in the car doesn't work--I never noticed how important a dome light was until I tried to read my little direction sheet held up to the headlights of the cars behind me! I know that I was a little confused at first when we moved to our current country home--especially by the way that roads curve instead of going in just one direction. But this is bewildering. I think it's more confusing than Chicago was. And I've lost a bunch of my skills from when I lived in the Windy City. I'm sure I would learn how to navigate this place if I lived here, but I won't be here long enough this week and next to get my skills up to competency. It's only Wednesday, but I find myself pining already for central Pennsylvania country roads. 1. Someone had a problem in your church this week. 5. If they don't get meaningful help, they will go elsewhere. 6. Whatever "help" they received, they will use to help others! Like many proverbs, it's both pithy and profound. How true. And how hard it is sometimes to know when to apply which truth! The first day of class is over, and it went well. We studied Marriage Counseling with Winston Smith and Counseling and the Church with Tim Lane. A lot of the material has been foundational, basic, and review today, but it's great stuff. I'm meeting some great folks and enjoying just being here. Titus had been left by Paul on Crete to identify true elders and to combat false teaching and to provide gospel-applying instruction to the believers on Crete so that their lives matched their doctrine. Last week, we looked at the first 7 verses of chapter 3 which highlight the glorious gospel of grace–that “He Saved Us.” And that led us to a table of kindness, love, mercy, grace, and hope. Today, I want to read the entire third chapter and especially focus on verses 1 and 2, and verses 8 through 15. These are, again, the practical outworkings of the gospel. They are “applying the gospel” to all of life. And there is a particular phrase that appears three times in the English translations in this chapter that I think sums up the burden of this passage. “Doing What Is Good.” Or King James, “Good Works.” Listen for that phrase, as I read it. Especially with the phrase, “Devote themselves” in front of it. We should be devoted to doing good... #1. IN SOCIETY. I get this from verses 1 and 2. He starts with following our leaders. Look at verse 1. Paul instructs Titus to remind the church to be submissive to government, obedient and ready to do the right thing. That word “good” here is the Greek word: AGATHOS. And it has the flavor of doing the right thing. The good thing in any given situation. Submissive. Obedient. Devoted to Doing Good. It doesn’t sound so hard until the sign says to go 55 and you feel like going 70. Right? We all think that we’re fine upstanding citizens until we realize that we are confronted with big AND SMALL ways of being unsubmissive to authority. Some of us may be tempted to cheat on our taxes. Others of us might be tempted to park where we are not allowed. Titus was supposed to teach the people that Christians are subject to authority and obedient and ready to good whatever is good. Do you need reminded of that this morning? I needed that. We need to be devoted to doing good in society, with our leaders and with all of our neighbors. Look at verse 2. There’s not a lot of wiggle room in that verse is there?! This is what Christ-followers do. They don’t slander anyone. They don’t tell falsehoods, or half-truths about someone else and damage their reputation with anyone. They are peaceable and considerate. Christ-followers love peace and unity and don’t go stirring up trouble where it doesn’t need to be! And they think of other people ahead of themselves. Christ-followers show true humility (some translations have “courtesy” here) toward everyone. They don’t think of themselves as better than others and they treat people like don’t! Do you need constant reminding of these principles, too? I do. But, but, but...what if someone slanders you? “To slander no one.” Not even those who drag your name through the mud. This is how a Real Christian operates in society. And it looks very different from the way the world works, doesn’t it? What if all of the people who claimed to be Christians lived out just verses 1 and 2 of Titus 3? What would happen to our witness? What would happen to our society? It would be changed. Because of changed people. We should be devoted to doing good in society. That means to other people. Is there a situation right now that you’re involved in where you have been running against verses 1 and 2? It’s time to ‘fess up and devote yourself to doing good. #2. BECAUSE OF THE GOSPEL. We talked about this at great length last week. Isn’t it glorious? See what Paul is doing? He says that verses 3 through 7 are a trustworthy saying. The gospel is true. It can be trusted. And Paul says that Titus needs to stress the gospel with the church–why? Again, this is applying the gospel. Christians don’t devote themselves to doing what is good because they are good people in and of themselves. If someone says, “You’re a good person,” we know better! Right?! Christians devote themselves to doing good because of the gospel! We do devote ourselves to doing good, but not because we’re good or because our good works somehow balance out our bad works or add up to our salvation–no because we have been saved to serve. Blessed to be a blessing. Rescued to reach out. Because Jesus died for me, I can now devote myself (notice that strong word–DEVOTE myself) to doing what is good. Now, we can’t see it in our English versions, but there is a different word for “good” in verse 8 than there was in verse 1. This is the word “KALOS” and it has the flavor, not just of doing the right thing, but doing the morally beautiful thing. It involves not just “not doing bad” (negatively), but positively doing good. Doing something, taking action that is morally praiseworthy and beautiful. And here, I think it emphasizes that we do good works that help other people. It’s profitable for everyone. It’s good for others. And it all comes from the gospel! Christians are devoted to doing good, not because they are good. But because they are believe the good news! Good Works Come from the Good News! Now, of course, the big application question is, are we devoted to doing good? I know that I like to think of myself as being devoted to doing good. Or am I just sitting on my rear end, thankful for the gospel, but not letting it move me one inch? How about you? Are you devoted to doing good? It will probably cost you something, if you are. For almost a year now, I’ve volunteered with Meals on Wheels (you can see a little ad in the bulletin that they’re still looking for more volunteers). I like doing it, but Thursdays roll around and I always have something important that I’m working on that takes a backseat to going over to home, and picking up one of my children, and then running out to Kylertown and running all over the countryside delivering meals to wonderful older folks, many of whom have yappy little dogs that delight in chasing me and making me wonder if I’ll still have heel when I leave! And I’ve been coming up on a year and having to decide if I’m going to re-up my commitment or let it slide. What about you? Are you devoted to doing good? And we do them because of the gospel! #3. IN SPITE OF THE FALSE TEACHERS. It seems like this must have been what the false teaching was focusing on at Crete at that time: controversies and genealogies and arguments and quarrels about the law. Of course, he’s not saying to not engage in controversy at all. The elders actually had to be equipped to refute this false teaching, remember that from chapter 1? But somehow Titus and the other leaders were to steer clear of getting embroiled in it so that it took up their minds and their ministries. And they sure weren’t supposed to adopt these teachings and arguments! And when someone came around with them, they were to be treated strongly. Remember, doctrine matters. It affects life. And if someone is teaching something heretical and trying to divide the church over it, they need to be confronted, taken through a process of confronting, and then disciplined. Church discipline, rightly practiced, is love for the offending party, love for the church, and love for the Truth. And Titus and the elders at Crete needed to practice it. If not, the church would get infected. So, surgery was needed on the Body of Christ. This is not popular these days. Everybody just wants to get along and be nicey-nicey, except for some people who just want to fight. But Titus wasn’t allowed to do either of those. He was supposed to avoid the fighting and put the divisive and the heretical out of the church. So that they could devote themselves to doing what is good. In spite of the false teachers. Because there is good work to be done. #4. TO LIVE FRUITFUL LIVES. Apparently, Zenas and Apollos were carrying this letter to Titus and Titus was supposed to look after their needs and support them and send them on fully supplied. The King James has “unfruitful.” I think that’s great. We need to learn to devote ourselves to doing what is good, so that we are fruitful! So that our lives are productive. So that they produce good things. So that there is fruit. We are, as Christians, saved to bear fruit. People should look at our lives and say, “What has gotten into that person!” They are so good! So good to be around. So productive. So fruitful. So much a blessing for others. A year ago, I asked this question of our church. What would the community say if our church disappeared? Would they bemoan the fact that the Ark Park got taken down and shipped off? Would they feel it at all that our little Jesus-worshiping, disciplemaking community was gone? Would they feel like some of the fruitfulness had been sucked out of our community? We’ve seen how communities feel when jobs leave with companies. What would happen if our church left this community? Not just that our gospel witness had disappeared (as all important as that is), but if our gospel-produced good works disappeared, what effect would that have? I’m not sure. I’d love to see our church be an integral part of our community–a city set on a hill. A light on a stand. A worshiping, disciple-making community that let’s its light so shine before men that they see it and glorify our Father who is in Heaven. I pray for fruitfulness for our church. Because of the Gospel. Not to earn our way but because He’s given His all for us in His mercy and grace. In Spite of the False Teachers. Avoiding them where possible and confronting them and discipling them when they get in our midst. Devoting Ourselves to Doing Good. To Live Lives that are Fruitful. What is the application of this message for you this morning? What do you need to change, to do differently, to start? Does it have something to do with submission to our government and its leaders? Something to do with your neighbors? Some new initiative that you need to undertake to be devoted to doing good, to being fruitful? Or maybe it’s renewing your commitment to doing something good. Whatever it is, can do it because of the gospel. You can devote yourself to doing good because of the grace of Jesus Christ. If you have not yet come to believe in Jesus Christ, I invite you to do it today. You can turn from your sins and put your trust in what He did for you. Not righteous things you have done, but the mercy and grace shown to you at the Cross. His Good News is sufficient to save you and then to equip you to devote yourself to doing what is right and what is morally beautiful, what is good. 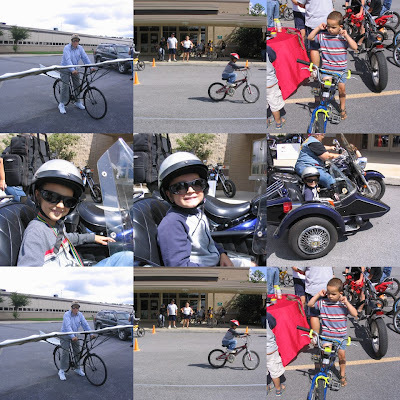 Our church sponsored a free Bicycle Derby at the West Branch Community Days this year. We had a pretty good turnout and a fun time. Blair Murray showed up with a strange flying bike contraption and the Christian Motorcyclist Assocation was there, too, giving away free rides. Drewby even won the "slow race" for his age bracket. Our Mitchell Monkey Tower is 1 year old this week! As I get older, I'm getting softer, I guess. Last night, Heather and I watched another tear-jerker of a movie, and I got to sobbing about half way through. I didn't mean to, but the movie just toyed with my emotions! The movie was Dear Frankie [official site, wikipedia article, CT review, Amazon page]. I don't know how to describe it without giving away the plot-twists (there are a number and they're well done). Read the reviews if you like the plot spoiled. It's about truth, lies, love, fear, pain, loneliness, happiness, and most of all father-hunger (one of the main problems of western civilization). It takes place in Scotland (was an indy film) and has understated, yet right-on acting [warning: it's PG13 for abusive language, but it's pretty watchable and not dirty]. Powerful and painful and sweet. Much recommended, especially for sentimental softies. One theme on my blog these last 3.5 years has been whether or not to engage in blogging because of the temptations inherent in the medium for the sins of the tongue. I finally decided, with the aid of my wife, that godly blogging was possible and have set out to do it at a moderate pace (my goal is to post something worthwhile between each sermon, that's twice a week on average). I have also kept an eye cocked for good advice on how often and how to blog wisely and well (ex: Randy Alcorn on comments, RCO on blogging only once a week). This week, David Powlison and Tim Keller co-wrote a piece on Justin Taylor's blog which is well worth reading: Should You Pass on Bad Reports? And Powlison has amplified it with some follow-up comments today. Good stuff. We're nearing our 1,000th post on Hot Orthodoxy (this is #992). I pray that the words of my blog and the meditation of my heart is pleasing in the Lord's sight. T.J. Addington on the ripple effect of changed lives. Yes! All of the pre-course work is done for my CCEF classes next week. Praise the Lord! And thank you, gentle readers, for praying. John Gottman doesn’t offer a definition of a successful marriage, but his seven-part counsel for his readers suggests something like this: Marriage, at its best, is equal and affectionate partners in life achieving their dreams together. Couples can do this by increasing their “emotional intelligence” in specific ways. Gottman believes that science has proven that couples who are dialed into each other’s lives in such a way that they really know their partners (especially their “dreams”), enjoy one another, listen to each other, and resolve at least their easier conflicts will stay together and achieve some measure of happiness (apparently the sunnum bonnum of marriage). In this scheme, God is almost completely absent, at least in any authoritative sense (Almighty Science has taken His place). The only reason given for a couple to stay together when having trouble is the long term health benefits for them and their children (and that’s only if there is a good chance of the marriage becoming happy)! There is no transcendent quality to marriage beyond the personal dreams and “shared meaning” created by the couple themselves (principle #7). There is plenty of good advice for growing in the skills needed to love your spouse–turning towards your spouse is a great idea! However, the skillful love required is definitely natural, not supernatural, a few of the suggestions are atrocious (ex. speaking harshly against someone who has had a conflict with your spouse to build solidarity as a couple), and the whole thing assumes that each partner is generally a good person who just needs to work on their relational skills. “Becoming a dream detective” (part of principle #6) is terrific counsel for understanding what motives underlie a behavior or a conflict. But each dream suggested is described as “beautiful” and equal with any others. No dreams are considered bad, evil, sinful or even simply inordinate. What if these dreams collide? Gottman has no solution for such situations, believing that some conflicts are unsolvable and, probably, that most dreams are immutable. In direct contradistinction, Gary Thomas believes that marriage is all about God, supernatural grace is needed to truly love your spouse, and some dreams need to die. In Sacred Marriage, Thomas describes matrimony as a covenant relationship before God that is intended to sanctify both partners. The marital sunnum bonnum is holiness, not happiness (though happiness would be an eternal by-product of holiness!). This book is not full of practical advice for building “love-skills;” rather, it is packed with rationale for leaning into suffering service of your mate to shape your character and grow your relationship with God. Thomas teaches that marriage is a school of agape love, a laboratory for prayer, a classroom for learning to serve, and an mirror to expose sin and reveal God. Most of the chapter subtitles include the word “can,” describing the personal spiritual benefits that can be gained by obedience to God in a marriage (the other chapter subtitles also imply this). For Thomas, failure in marriage means not taking advantage of those sanctifying benefits and dishonoring God. The book urges Christians to embrace the harder parts of marriage, not only because God says to, but because it will ultimately be good for them. Leslie Vernick’s book is written in much the same vein as Sacred Marriage, even favorably quoting Thomas’ book numerous times. Her main emphasis, however, is how (and why) to act righteously when your mate is acting unrighteously. The purpose of marriage in Vernick’s book appears to be the glory of God and the growing holiness of and attendant blessings on the obedient partner. It is very sympathetic to those suffering in difficult marriages, but calls them to always opt for obedience even when (especially when!) sinned against. Marriage is the crucible in which the fire of trial refines the gold of the believer. Vernick emphasizes the power to choose to do what is right (flowing from a heart centered on God). Spouses need to choose to respond (not merely react), to choose to guard their hearts, to choose to worship, to choose to grow, to choose to love. Believers are not controlled by the actions of their partners but can (by God’s empowering grace) act in ways that are counter-intuitive and God-pleasing. There are a number of practical suggestions of how to make these good choices while embroiled in a difficult marital relationship (chapter 8 on “Gifts of Love” is especially helpful). I regularly give this book to counselees whose partners have bewilderingly gone off the rails. Vernick also emphasizes the blessings that come with obedience in the marriage but stresses that these blessings may not always include the positive change of and/or reconciliation with an offending spouse. The marriage does not exist for itself and may die a painful death, and yet even then, it can be successful in God’s all wise eyes. Taken together, How to Act Right When Your Spouse Acts Wrong and Sacred Marriage both present a Christian view of marriage–marriage as God-given, God-centered, God-blessed, God-empowered, and God-accountable. God is strangely missing in David Olson’s book. Even though Integrative Marriage Therapy is part of a Lutheran book series on “Creative Pastoral Care and Counseling,” I didn’t detect even one reference to the Lord. For Olson, apparently, the important parts of marriage are only horizontally oriented. Olson’s approach comes from a “family systems” understanding of human behavior. “Family therapy focuses on the interaction between people as the principal area for insight and change. By creating changes in the both the structure and the communication of the family, one can frequently resolve problems and achieve a more appropriate sense of equilibrium” (pg. 17). In this understanding of the family, marriage is seen as an “executive subsystem” necessary for leading a healthy family (pg. 57). The chief goal of family therapy seems to be achieving and then maintaining a sense of family equilibrium sometimes referred to as “homeostasis.” Homeostasis seems to be a worldly counterfeit and echo of the biblical idea of shalom. (Note: At times, Olson also seemed to indicate that homeostasis can be a bad kind of equilibrium that a family unhealthily maintains.) Olson introduces seven different models of therapy within this family systems understanding and then suggests a flow-chart method of integrating them to serve the varying needs of different families to reach a healthy homeostasis (pg. 74, Diagram 4). There is real truth in this approach. Our behavior as individuals affects the people around us, and their lives affect us. We live in community and are shaped by it. Our families are powerful influences upon us, providing both temptations to sin and (in the best families) encouragements towards righteousness. However, in Integrative Family Therapy, the individual’s responsibility for their own actions seems to be greatly diminished. The system seems to control each of the parts. There is no definition of a healthy marriage here. Married couples are taught to not “triangulate” (siding with their children over against their spouses) and encouraged to see themselves and how they operate as part of the problem that their children are having. But there is no final standard for deciding if a marriage is itself healthy. Everyone does what is right in their own eyes. My own understanding of marriage would share the same basic principles as Gary Thomas and Leslie Vernick. Marriage is a sacred covenant between a man and a woman before the Lord that exists to glorify Him while sanctifying and blessing them. It is all about God. My wife Heather and I are not the main actors in our life’s play, and our marriage is not ultimately about our marriage but about Him. We are married coram Deo, in the presence of God. This God-centered reality comes out in my counseling of couples. I try to re-frame their understanding of their marital problems and opportunities into biblical categories such as idolatry and sin, active love (defined by 1 Corinthians 13, not Top 40 radio), forgiveness when sinned against, obedience to God’s design (including husbandly headship and wifely submission), faithfulness to our promises, and God-pleasing desires. The ultimate and greatest good for a marriage is one in which both partners are married to the glory of God. Of course, few of my counselees are looking for that kind of talk. Often, by the time they reach my office, they just want to know if their marriage will survive. I try to both practically help them keep going in healthy directions and to lift their gaze to what their marriage could become. 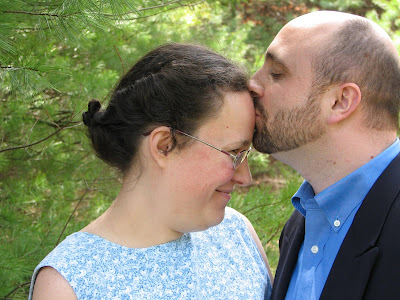 In addition to what Thomas and Vernick are teaching, I would want to also emphasize marital joy. Marriage is God’s gift, not just for sanctification but also for the pleasure and mutual enjoyment of the couple in themselves and in God. John Piper says, “Marriage is a matrix for Christian hedonism,” and he instructs Christians to find their joy in the joy of their beloved. This is not always possible, but when God grants it, it’s a wonderful thing! While reading for the four books for this pre-course assignment, I was repeatedly amazed at how blessed Heather and I are as we enjoy each other in the covenant of marriage. The boundary lines have fallen for me in pleasant places! Praise the Lord! 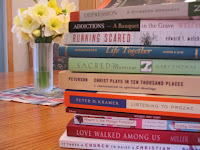 I've read all of the books for my CCEF Class. Now, this morning, I have to write the last paper. Randy Stinson has started a good series on lessons to be learned while watching the Olympics. I'll be reading these articles with interest. Dan Ledford on the Immutability of God. Byron Harvey on Paul's Boldness to Witness to Christ. Paul has been instructing Titus in what to teach the new church on the island of Crete. He had left Titus behind to identify true elders to combat false teaching and to provide gospel-applying instruction to the believers on Crete so that their lives matched their doctrine. The title for our series this last month has been “Applying the Gospel” and could very well describe chapter 3, as well. There is really no good way to break up chapter 3, but I want to take 2 weeks to study it anyway, so this week, we’ll look at verses 1 through 7 and then next week, we’ll look at verses 1 through 15 and take the whole chapter together to see the bigger picture. What I want us to focus on this morning is the gospel itself. The theme of the whole letter is applying the gospel, and that’s what Paul is doing here in chapter 3, but verses 3 through 7 in English are one long sentence in the original Greek that basically IS the gospel, and I think God wants us to meditate deeply on it this morning before we celebrate it together at His Table. I hope that we never get tired of talking about the gospel. I hope that we never grow weary of rehearsing what happened to us when we were rescued from our sins. I hope that we never get complacent about the gospel of Jesus Christ. But it didn’t for the apostle Paul. He couldn’t get familiar enough with the gospel. He repeats it over and over again in his letters. The gospel is the engine that drives Paul, and it should be for us, as well. The whole book of Titus is about applying the gospel, and that’s what Paul is doing in verses 1&2. He’s applying the gospel. These are applications, and we’re going to look at these verses more closely next week. But you can see just in your first glance, that Paul is continuing to instruct Titus in how to instruct the Cretan believers to live out the implications of the gospel. They are to live as Christ-followers. To be Christian citizens. To be obey Jesus. To be ready to do what is good. To live as Christian neighbors. To show Christian humility. We used to look like the world. And now we are to look differently! We used to look like the world. And now everything has changed. We used to be just like the world, and we needed SAVING! That’s what folks are like, down deep, before they come to know Jesus. That’s what I was like, and it’s what you were like, too. I have 6 brief points this morning, they’re mostly just taken right here from the next few verses. #1. WHEN THE KINDNESS AND LOVE OF GOD OUR SAVIOR APPEARED. Notice that word “appeared?” It’s the same word that we saw back in chapter 2, verse 11 last week. It’s the word that we get our word “epiphany” from. An appearance, a manifestation, a coming into view. The kindness and love of God our Savior came into view. God’s love showed up–in person! We needed saving. We were lost. We were dead in our trespasses and sins. And then Jesus showed up! That’s what happened! Jesus showed up! And He lived a perfect life and then died on the Cross, one of the cruelest deaths devised by men! Because of what was in His heart. What does verse 4 say about His coming? Why did Jesus come? Why did He go to the Cross? What are we celebrating at this Table? Kindness and LOVE. The Greek word is “philanthropia” meaning a love of humanity. “God so loved the world...” ...That God our Savior Appeared! Don’t forget that. Don’t miss that. As we go to this Table this morning, we remember that this is a Table of love. A table of kindness. God loves us, friends. God loves you. Jesus loves you. Do you need to hear that this morning? We need to hear it every day, don’t we? He saved us when the kindness and love of God Our Savior appeared. #2. HE SAVED US NOT BECAUSE OF RIGHTEOUS THINGS WE HAD DONE. That’s what verse 5 says. That’s the opposite of all of the other religions in the world. They are all about man trying to reach up to God. They are all about self-improvement projects. Christianity is not based upon our good works. Christianity is not based upon our righteous deeds. And any teaching that bases salvation upon our good works is not Christianity! The apostles stress this again and again and again. It’s not what we have done. It’s not be works of law. It’s not by righteous things we have done. Now, we’ll do righteous things! We better. We’ve been changed by the gospel. That’s applying the gospel, and that’s what this book is all about. But let’s be clear: we are saved NOT because of righteous things we had done. No! He saved us #3. BECAUSE OF HIS MERCY. He didn’t save us because of something inside of us. He saved us because of something inside of Him! When we go to this Table this morning, we remember that this is a Table of MERCY. It’s not a Table that tells us how good we are. We aren’t. It’s a Table that tells us that we have not been good and not been good enough. But that God had mercy on us. Justification is being declared righteous. It is declaring us righteous, not on the basis of righteous things we have done, our righteousness, but on the basis of His righteousness. His mercy and grace giving us the righteousness of Jesus Christ. It bring Him the most glory, and it’s just what we needed! Many people are trying to justify themselves in their own power, and they’ll all fail miserably. Paul tried to, and he was really good at it! The only way to live is to be justified by HIS grace. That’s why He saved us: because of His mercy. As we come to the Table this morning, we are reminded of how unworthy we are to receive blessing from God and how thankful we are to live under His mercy. And it’s more than simply justification that saves us. It is also the inner work of the Holy Spirit. #4. HE SAVED US THROUGH THE WASHING OF REBIRTH AND RENEWAL BY THE HOLY SPIRIT. This is what it says in at the end of verse 5. This takes us back to our sermon series from the beginning of the year on the ministry of the Holy Spirit. Verse 6 says that the Holy Spirit was poured out on us generously through Jesus Christ our Savior. What Jesus did on the Cross purchased the benefits of having the Holy Spirit in our lives. Three words: Washing, Rebirth, Renewal. My soul is given a new birth (a regeneration). My heart is given a new lease on life. That all happens when I come to faith in Jesus Christ. As we go to this Table this morning, we are going to a Spirit-Table. Did you notice the Trinitarian nature of this passage? It’s there. God the Father having mercy. God the Son show up and dying for us and sending God the Spirit to wash us, regenerate us, and renew us. He Saved Us Through the Washing of Rebirth and Renewal by the Holy Spirit. To what end? #5. SO THAT WE MIGHT BECOME HEIRS HAVING THE HOPE OF ETERNAL LIFE. It goes from the misery and perversion of verse 3 to the joy and hope and glory of verse 7. This is biblical hope here. It’s not wishful thinking, “Oh, I hope I get a Texas Sheet Cake this week.” Good luck. No, this is faith in a sure thing–something promised me by God and not based on my righteousness, but on His mercy. We are heirs. Everything promised to Jesus is our inheritance. He took our sin, we get His inheritance. That’s why He saved us. He saved us to give us everything worth anything! That’s the gospel, friends. That’s the good news about Jesus. It’s all true for you and for me if we believe it. We are heirs having the sure hope of eternal life if we turn from doing it our way and trusting in Him and what He did for us in His kindness, love, and mercy. He saved us: When the Kindness and Love of God Our Savior Appeared. He saved us: Not Because of Righteous Things We Had Done. He saved us: Because of His Mercy. He saved us: Through the Washing of Rebirth and Renewal by the Holy Spirit. He saved us: So That We Might Become Heirs Having the Hope of Eternal Life. And #6. HE SAVED US: AND, IN SO DOING, HE CHANGED OUR LIVES FOREVER. We don’t live like verse 3 any more. We live like verses 1 and 2. Not because we’re so good in and of ourselves. We aren’t. And it’s the greatest thing in all of the world. As we come now to the Lord’s Table, we gather around a Table of Love and Kindness. We gather around a Table, not of Our Righteousness, but of His Mercy and His Grace. We gather around a Spirit Table. A Table of washing, rebirth, renewal. We gather around a Table of Hope. The sure and certain hope of eternal life. We gather around a Table of Salvation.